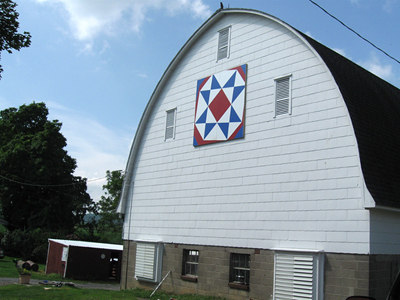 Frey Farm Quilt "Tilted Ohio Star"
The Ohio Star design was chosen to honor the Frey's daughter-in-law, Sandy, who was raised on an Ohio dairy farm. The "tilted" Ohio Star design is from the Ohio Star quilt book by the American Quilting Society (AQS) and features the results of a contest at the Museum of American Quilters Society (MAQS). Isaac and Charlotte Frey moved to the farm in the spring of 1888, just after the big blizzard. the farm was known as the "Soup Bean Farm" -- a poor farm that would grow little else. The neighbors said the Frey's would not last one year. They stayed and decendants are still living on the farm. Arthur and Mary Frey and then Harry and Marian continued on as share croppers until 1951 when the then century-old frame bank barn was stuck by lighting and burned. Members of the Stewartsville Grange #121 moved the 25 cow dairy herd to the vacant barn that neighbor Roy Oberly owned. Grange members also donated hay and the Frey's were able to purchase the farm - since the landlord did not wish to rebuilt the barn. Barn construction was started almost immediately and the gothic arch roof design (sometimes known as "Hindenburg") utilized prefabricated laminated rafters for speedy construction. The 36 x 134 foot, 50-cow dairy barn was completed in 1952. the last of the registered Holsteins left in 2002 and the mow now holds hay for 40 white face Herfords. The farm currently consists of 379 acres, some of which was settled by Bob's mother's ancestors (the Melicks) in 1764. The walls of the original homestead still stand.